I promised a bit of an update on what Cthulhu Reborn is working on, and what we hope to release in 2018. In the past couple of years most of our attention has been on getting the Convicts & Cthulhu product line up and properly supported. Now that that’s going along well (with well over 1000 copies of the core C&C book out there and in the hands of gamers), it gives us some bandwidth to think about other things as well. Of course that doesn’t mean that we’re going to slow down on the C&C releases — far from it — but rather that we hope to kick off some other product lines as well as supporting and growing C&C. I always feel that announcing future products (and product lines) is a bit like tempting fate — as soon as you put pen to paper (or electrons to screen, or whatever), Fate seems to conspire to throw up roadblocks to make you look stupid. Or maybe it just seems that way. Anyway, let’s throw caution to the wind and announce some stuff anyway. 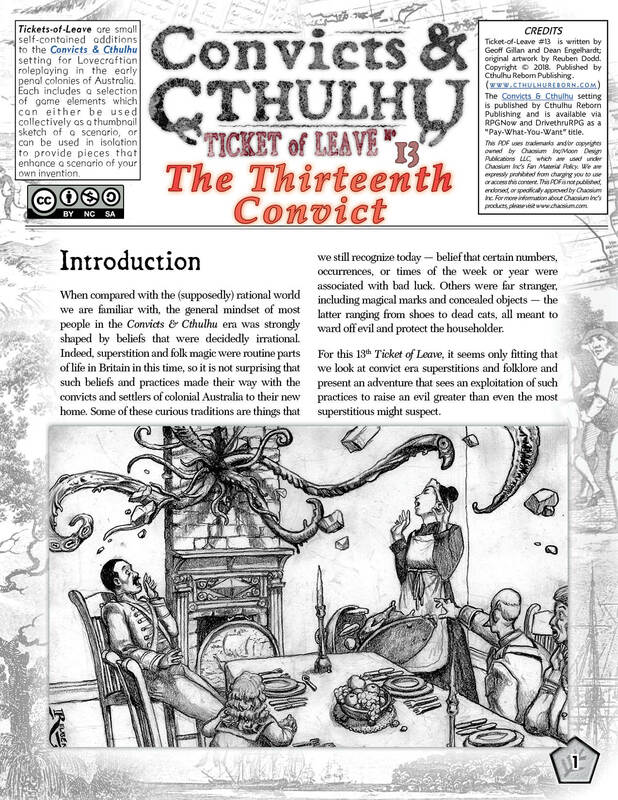 We have previously announced our plans to re-issue Convicts & Cthulhu as a standalone RPG, and that is still the plan. Geoff Gillan has been hard at work digging up new historical data to flesh out the system. We have also been looking closely into the Rennaisance system, as well as chatting with the (extremely helpful and nice) folks at Cakebread & Walton, who created Rennaisance. There is still work to be done at figuring out exactly how we want some of the game mechanics to work, to best bring out some of the unique features of the convict setting. One thing that we’re toying with is making some heavy use of Renaissance’s “faction” system to try to capture some of the grubby corruption, nepotism, and graft that was a core part of life in the prison colony. We have a first draft of a game, and it’s looking good … but it all needs some more time and effort to finishing off. In the meantime, though, we don’t want to let the Convicts & Cthulhu setting languish. So we will still be continuing our general plan to release one new PDF supplement every two months or so. We were supposed to release one in April, but ill-health has consumed a big chunk of people’s time this month, so Ticket of Leave #11 probably won’t see release until May. In some ways, though, that is fitting because May is the second birthday of the C&C product line! 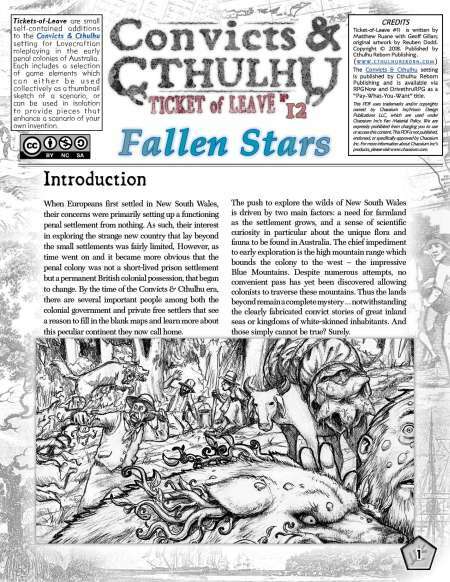 Sometime late last year, we were approached by the super-talented Jo Kreil who we had worked with on a post-Apocalyse Australian wasteland scenario for Australian Aeons (forthcoming from Chaosium, date TBD). Jo really enjoyed the idea of writing about post-Apocalyptic horrors, and wondered whether we might be interested in publishing an anthology of scenarios with that kind of flavour. 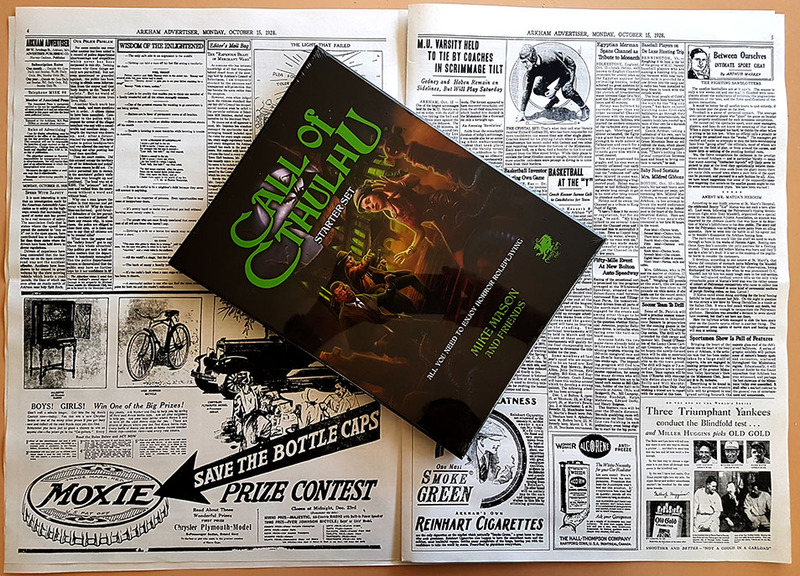 Of course we said “yes!” And so was born the idea of APOCTHULHU, an anthology which aims to showcase several different visions of what the dystopian world “after the stars come right” might look like. 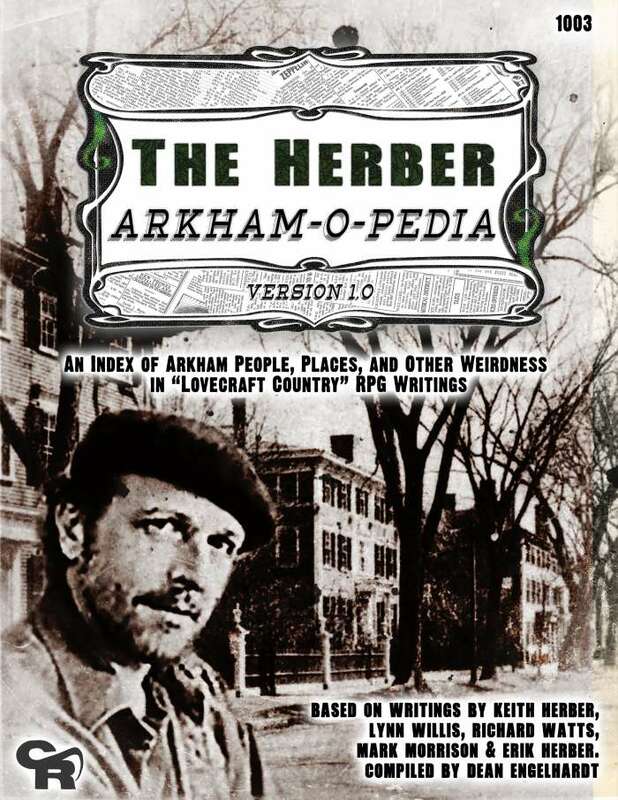 We have been able to sign up a collection of some of our favourite Lovecraftian RPG writers — some of them seasoned veterans, others relative newcomers to the industry. Jo will be the principal editor for the book, but I will be doing all the boring behind-the-scenes things that need to happen to bring a book like this together. The current plan is for the scenarios to make use of a slightly tweaked version of the Delta Green RPG (although none of the scenarios have any reference or relationship to the Delta Green universe — we just like their OGL system mechanics). So far I have been really impressed by the different perspectives that authors have brought to their view of what a Cthulhuoid post-Apocalypse might look like. I must confess to being a little worried that everyone would dream up similar Apocalypses (“armies of deep ones march out of the sea; roll credits”). But I guess there are a lot of different Lovecraftian ways to destroy the world — and our seven writers have each found a fairly unique approach. This book is currently still in the writing phase, and we will be surely announcing lots more details about it at a later date. We might release some parts of it early, too, just as a taster for what the end of the world might look like. Crispy. 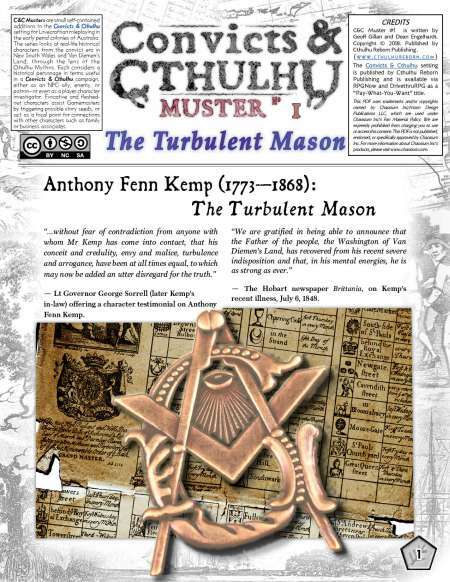 Most readers of this blog will know all-too-well Cthulhu Reborn’s long-held fascination with Jazz-Age newspapers and providing cool-looking props that soup up that old-faithful handout, the newspaper clipping. Heck, a while back we even released a nifty PDF-based toolkit to make it easier for people to make their own high-quality Jazz-Age newspaper clips. A while back we dreamed up the concept for a new type of game product. 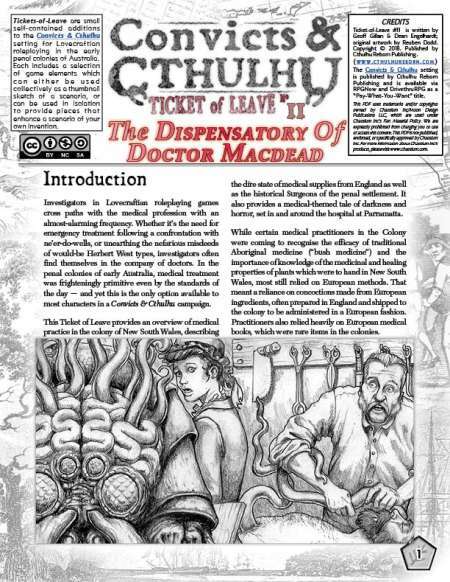 We are all well-used to the idea of buying a cool book of game scenarios and then perhaps having deluxe versions of the prop handouts available as free downloads. What if the reverse were true? 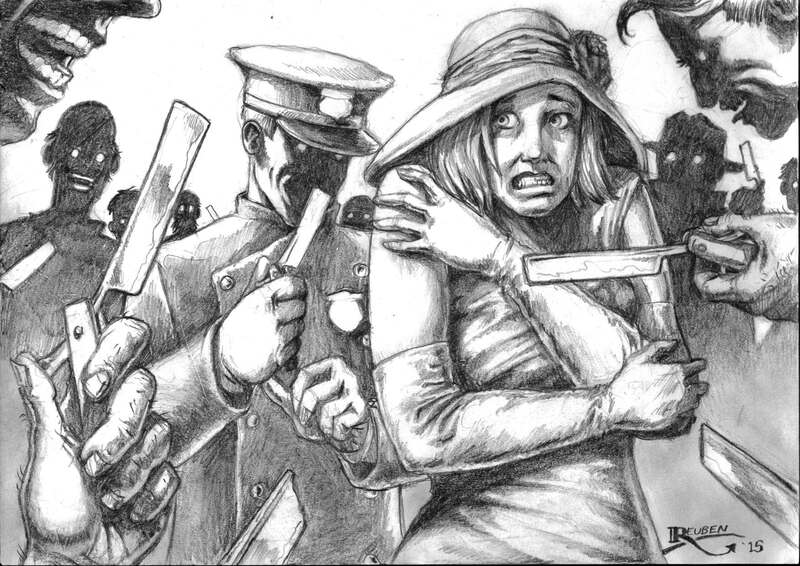 What if folks bought a huge, high-quality prop handout which in turn formed the core for a line of free scenarios that made use of plot seeds, clues, situations, and other elements drawn from the handout? 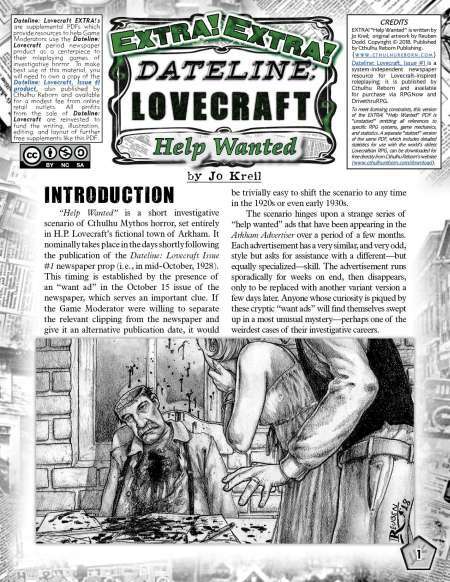 This is (broadly speaking) the concept that launched Dateline Lovecraft — a massive newspaper prop which puts a complete 12-page broadsheet issue of the Arkham Advertiser in the hands of you and your players. 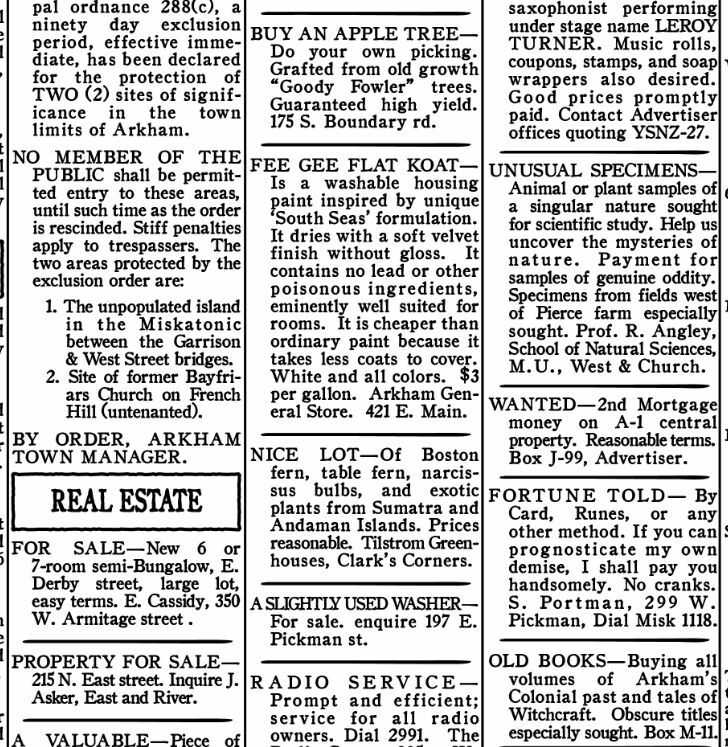 Buried in its pages are hundreds of hints of weird goings-on — right from the front-page headlines, all the way through to the wall-of-text that is the classified ad section on page 12. Whether its coded messages buried in the crossword clues, or cryptic allusions in an article on historic but notorious buildings up on French Hill … any of them might be useful launching-off points for a devious scenario of your own making. 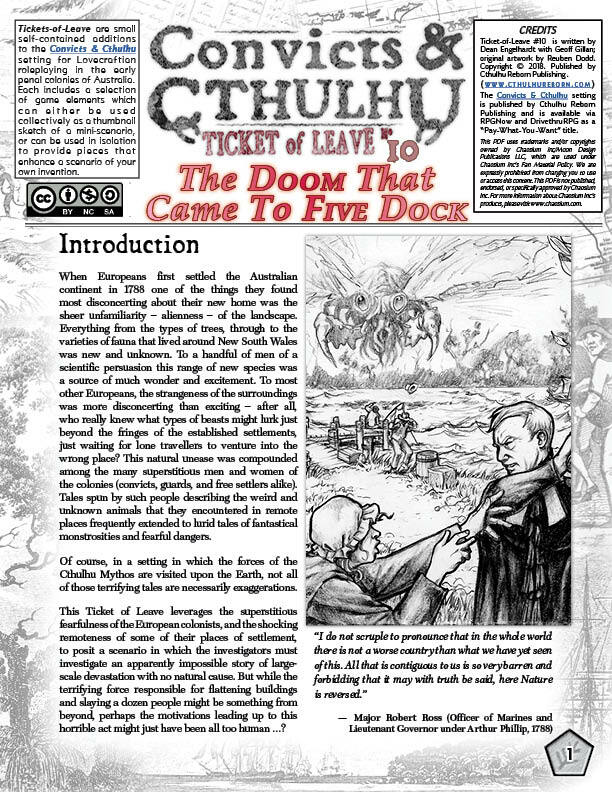 Even on its own, we think this kind of uber-prop would be a cool product … but something that could be made even cooler by the release of a series of free scenario PDFs that each picks up some of the quirky features (or even some of the mundane ones) and weaves a Lovecraftian tale of horror — much in the same way that our Ticket of Leave series continually builds and refines a library of plot ideas and nasty scenario options. About 2/3rds of the newspaper prop is already created … and believe me, there is a LOT of text that goes into each page of a 1920s broadsheet newspaper. We have also commissioned some awesome writers to create the first few of the freebie scenarios. Two are already written, awaiting illustration and layout.